In PF Collins’ 40+ years of providing warehousing and crating services, we have made thousands of wooden crates for domestic and international shipments. From large offshore oilfield equipment to a time machine movie prop, we’ve packaged it all. But none were as special as the crate we recently made for our new friend Killick, a Newfoundland dog travelling to Alberta with his family. 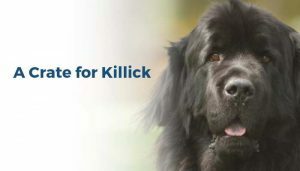 In making their travel plans, Killick’s owners decided to drive to Alberta but hoped to make the trip a little shorter for Killick by flying him on Air Canada. Upon arrival to see him off at St. John’s International Airport, they discovered that his dog carrier did not meet the specifications for air travel. For air transport, airlines require that animals have enough space to turn around while standing, to stand and sit straight, and to lie in a natural position. Killick’s carrier did not meet the requirements for his size and, therefore, he was grounded. As Killick’s owners and the Customer Service Agent tried to come up with an alternative solution, one of PF Collins’ Drivers happened to be picking up cargo and overheard the conversation at the Air Canada counter. 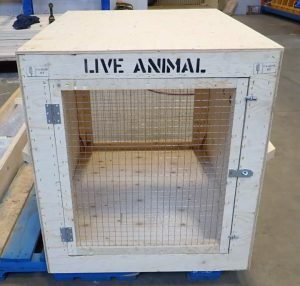 He suggested the owners contact his Manager to find out if PF Collins could build a crate that would meet Air Canada’s regulations and ensure Killick’s comfort and safety. 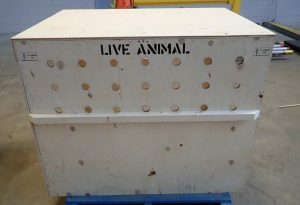 Upon receiving the call, along with dimensions and pictures of a small wooden carrier to be used as a template, PF Collins’ Warehouse Manager asked the Materials Handlers to build a custom crate. To meet Air Canada’s specifications, the crate required specific materials, including half-inch plywood, wire mesh, hinges, and locks. Furthermore, due to Killick’s size, considerable ventilation was needed. Holes were drilled in the plywood and mesh was cut to exact measurements. Markings were also applied to meet air transport regulations. The biggest challenge to constructing the carrier was adding enough structural framing to support a very large and heavy Newfoundland dog while meeting the airline’s height and width restrictions. Killick would need to be secure, safe, and comfortable during loading, offloading, and while in-transit. He would also have to endure a stopover and overnight in Toronto. Once the carrier was finished, pictures and dimensions were forwarded to Air Canada to confirm that it met their requirements. It did, and once final approval was received, PF Collins delivered the crate to Air Canada in preparation for Killick’s trip. Before embarking on his journey in his new carrier, Killick and his owners dropped by to say thanks to our Warehouse team for their help. Another satisfied customer! For more information on our warehousing and crating services, please contact your nearest PF Collins office. We offer a full range of Warehousing, Packaging & Distribution services to assist with all your storage and materials management needs.